Every major actor has a role or two that they have become immortalized as; a role that is an iconic staple within their careers. Marlon Brando has Stanly Kowalski from A Streetcar Named Desire, Sean Penn as Jeff Spicoli in Fast Times at Ridgemont High, Bette Davis’ Margo Channing in All About Eve, and Johnny Depp has Edward Scissorhands. When most people think of iconic star and beloved actor, Paul Newman, one of two roles come up, Luke from Cool Hand Luke and “Fast” Eddie Felson in The Hustler, and it’s no wonder as both roles are shining examples of Newman’s talent. The Hustler follows the highs and lows in the career of “Fast” Eddie, a young passionate pool player attempting to claim his spot as the greatest pool hustler in the country. On his quest to beat legendary pool player, Minnesota Fats (Jackie Gleason), Eddie must overcome a loss of luck, failed confidence and a struggling relationship with a lush college girl, Sarah (Piper Laurie), before he can make his way to the top. The best thing about The Hustler: Paul Newman. That name alone should be enough validation for its greatness, but alas, I will elaborate for the sake of a decent review. Newman’s portrayal of Eddie is phenomenal. Newman will forever be a legend simply because of his ability to convincingly convey human emotion and tendencies through his characters in his glory days. He became his characters, giving them realism through his naturally charming personality. Eddie is genuine and his drive for success is applauded by audiences because of his passion for the game. During a montage of Eddie’s first battle against Fats, Eddie is shown watching in astonishment as his famed idol competes with him. The look on Newman’s face says it all, with a glow in his bright eyes and an amused smirk on his face, Eddie’s face is lit with both astonishment and child-like admiration even when he loses to Fats. Ross Rossen’s direction is also a major highlight of The Hustler. Rossen creates a physically beautiful film that captures astounding picture-esque moments through stark black and white images and highly dramatized lighting. Being a product of The Classical Hollywood era, The Hustler is a simple straightforward narrative that delivers a conflict and solution with great character development in between. The world in which Eddie exists just drenches coolness; men play in tailored suits, cigars are smoked and lighting makes everyone look stoic and flattering. The Hustler is a fantastic character study done in the best way possible. It’s a classic that stands the test of time as being both entertaining and a beautifully captivating. If the imagery alone doesn’t intrigue you, then Paul Newman’s screen presence will. Now, it’s rare for a sequel to be as good as the original film it is piggybacking from, especially when that sequel comes almost decades after the original (Do we have to be reminded how awful Dirty Dancing 2: Havana Nights, Staying Alive, or Caddyshack 2 was?). The problem mostly lies in the fact that sequels rely on an already existing and now popular idea, instead of creating a newly original story within the same realm as the original. Sequels usually tend to use the original story as a crutch to make a subpar, watered down retelling of an original, except with different characters playing similar roles. The Color of Money picks up 20+ years after the events of the 1959 classic, The Hustler. Pool player “Fast” Eddie Felson (Paul Newman) has given up the hustling life and is now a whiskey seller in a blossoming relationship with a bar owner. While on the job, Eddie witnesses a young, cocky yet passionate pool player, Vincent (Tom Cruise), in action. 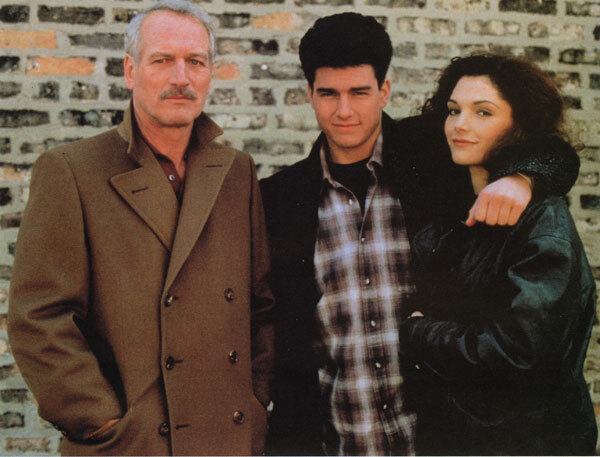 Impressed and enthralled with Vincent’s skill, Eddie offers to take Vince and his girlfriend and manager, Carmen (Mary Elizabeth Mastrantonio, under his wing in an attempt to perfect Vince’s skill in the world of professional hustling. The trio embark in a slew of ups and downs as Vince and Eddie often clash with one another leading to an inevitable final throw down and twist. The combination of stars involved in The Color of Money is astounding: Tom Cruise, Paul Newman, Martin Scorsese, and cameos from Bill Cobbs, a surprisingly great Forest Whitaker and John Turturro. With all of those great names come fantastic performances across the board. Although Turturro, as Julian, a coked out ex-protégé of Eddie, and Whitaker as Amos, a young hustler, are in the film for a split second, they dominate their scenes resulting in some of the film’s best parts. Also, it almost goes without saying but, Scorsese’s camera work and editing is just as impressive as one would expect. He beautifully captures the art form that is pool playing in impressively creative ways. With carefully edited tight close ups, the action and movement of the balls is framed and captured fluidly and seamlessly. 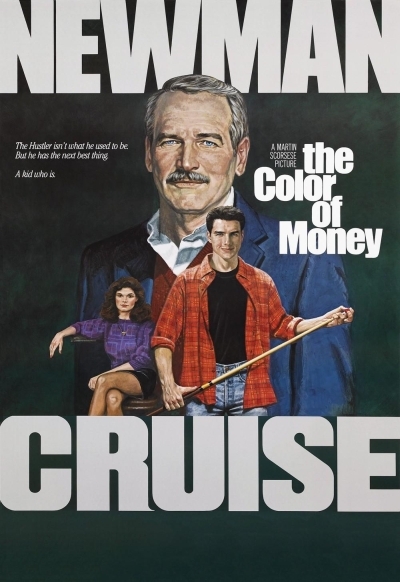 With that combination of greatness from Scorsese, Newman, and Cruise you’d expect The Color of Money to be epically great, but ultimately it’s just a fair film partly because it just doesn’t hold up too well by today’s standards. The Color of Money has, what I like to call, an “80s aesthetic.” You know, how most films from the 80s look like the decade because of the quaffed hair, awkward clothing, and the dominate use blue and red lighting and that grainy VHS look? It doesn’t have that sharp, clean look that films with great cinematography have and I’m not saying that because I’m used to HD. The Hustler was made in 1959 and looked incredible, which made watching it more pleasurable. And that’s where The Color of Money’s biggest flaw is; If you’ve seen The Hustler, (especially right before watching The Color of Money) then The Color of Money is just subpar in comparison. Not only does The Hustler simply look better, but it does a better job of developing its main character. Vince doesn’t receive that same treatment as Eddie in The Hustler. We as an audience are mostly only shown Vince’s brash, arrogant side whereas with Eddie in The Hustler, viewers are shown his soft and tender, vulnerable moments, making Eddie a more well-rounded likable leading character. Although its only two hours, I still felt like that The Color of Money drags on in many parts and ultimately it just results in watching countless arguments, numerous life lessons being spoken, and endless amounts of pool being played which begins to get tedious about an hour in. The Color of Money is good but it’s an outdated fair sequel that would have been better being left unmade. The likes of Cruise, Newman, and Scorsese should have been enough to make a an impacting, entertaining film but instead it’s a slightly bland product of the 80s. The Hustler = SEE IT. The Color of Money = AVOID IT. You think the Color of Money just should not have been made at all? That’s your conclusion? Is the existence of the Color of Money a threat to society? Lol for starters, I never indicated that. I said the Color of Money was fair. It’s not an awful film, but it’s not an exceptionally great one either. Should it have been made? Since you ask: no. 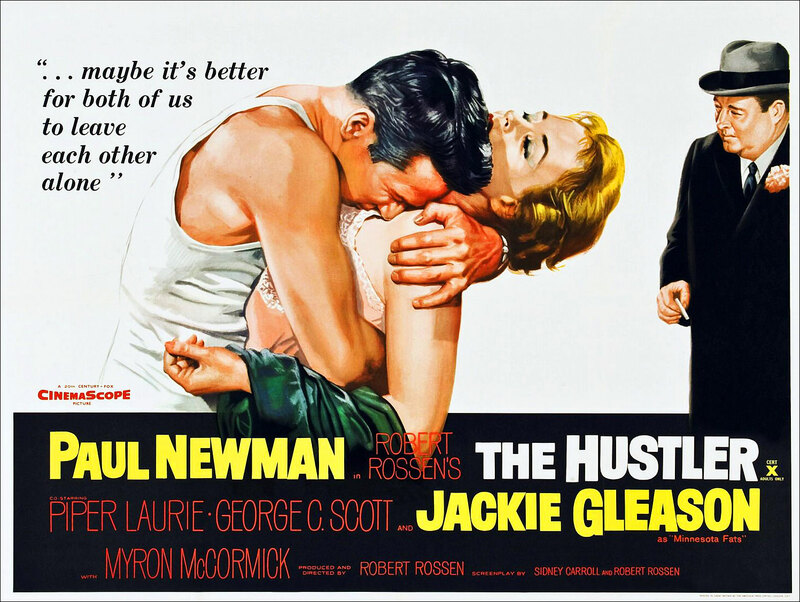 Paul Newman, Scorsese, and the aura of The Hustler would have been just fine had it not been made. But considering it has been made and its correlation to crime is undetermined I’ll say it’s not really a threat to anything except the integrity of the The Hustler. I am looking for a larger size print of the panoramic photo of Fats and Eddie lagging for the break that is featured in this article. I have found a cropped version for purchase, but the pano version is much better. Any idea where I could find it? Any help would be much appreciated! Unfortunately I’m not sure where to find that, but I’ll keep an eye out for you! Interesting, thanks for the information on that. I had no idea. That sounds like the makings of a much more fascinating movie than the Color of Money actually turned out to be. Thanks for the comment Sam! I agree with your allegory comment, that’s a good way of looking at it. Even Newman’s charisma takes a backseat in the The Color of Money too. Good film, but it definitely pales in comparison.